Alison Drake, Lorna Malkin, Jennifer Catch, Tony Wallace, David Pickersgill, Gillian Cohen, John Bell & James Knowles. The 130-year-old water wheel at Queen’s Mill in Castleford has a proud history. Its generating power made the mill the first building in the town to benefit from electricity. And when it was taken out of service decades later in 1970, it was the last vertical water wheel standing in Britain, with others already replaced by steam power. Now, Castleford Heritage Trust has launched a fundraising campaign to get the wheel turning once again. Alison Drake, chair of the trustees, said: “It’s a fabulous wheel. When we had a feasibility study done for the restoration project, it was said to be an absolute gem. Mrs Drake said the feasibility study estimated that the wheel could produce £25k to £30k worth of electricity every year. It is hoped that as well as powering the mill and its grinding stones, the wheel will create enough energy for the trust to sell to become self-sustaining. And members say it will benefit Castleford for years to come. “It will be a real feature,” Mrs Drake said. “People will be able to come from all over to enjoy the town, the mill and the water wheel. “It’s rare to have one in action and I think a lot of people will want to visit. The trust is appealing for business sponsorship and individual donations. Mrs Drake said volunteers had put in thousands of hours of work to transform the mill buildings and they are hoping the rest of the town will support them with the next step. The initial target is £20k, which will fund the replacement of the wheel’s 24 buckets and the restoration of its spokes. It is hoped work can get underway in April, marking the five year anniversary of the trust purchasing the mill. Project manager James Knowles said: “If we hit the £20k target this will release other funds for the project, which we hope to start work on in April. “First we’ll need to drain the water from around the wheel so engineers can have access to assess its condition and give us an idea of the work needed to get it turning again. 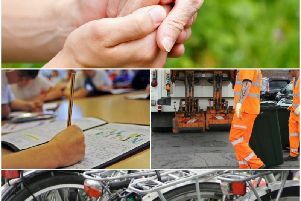 “We already have £50k from Wakefield Council for generating equipment but that needs the wheel to operate it, so the plan is to carry out the work in two phases. “We will aim to get the wheel back in action, then we will look to install the generator and connect it to the grid.